The FED 3 is a Ukrainian rangefinder camera inspired by classic Leicas. Over two million were produced between 1961-79. It takes 35mm film. 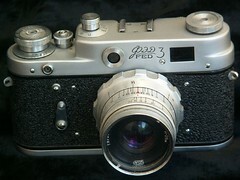 The FED 3 is an evolution of the FED 2 and the dimensions of the two bodies are identical. The top deck is modified because the FED 3 has to have a shorter rangefinder base to make room for the slow-speed mechanism. Shutter speeds are 1 sec, 1/2, 1/4, 1/8, 1/15, 1/30, 1/60, 1/125, 1/250, 1/500s and "B". 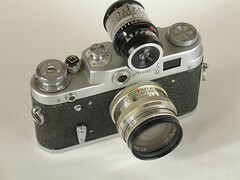 In common with many Soviet-era cameras, the shutter must be cocked before the speed is altered.